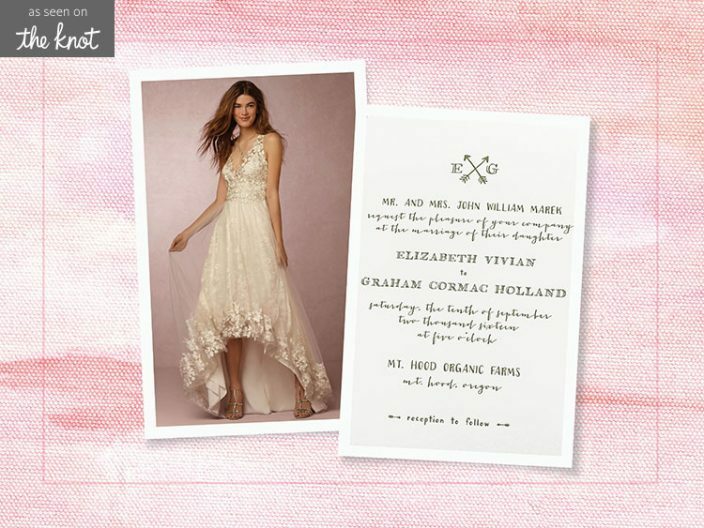 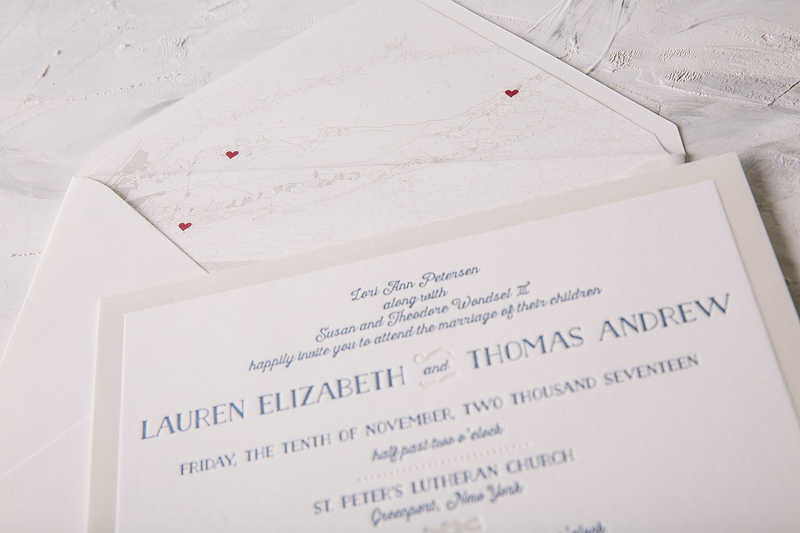 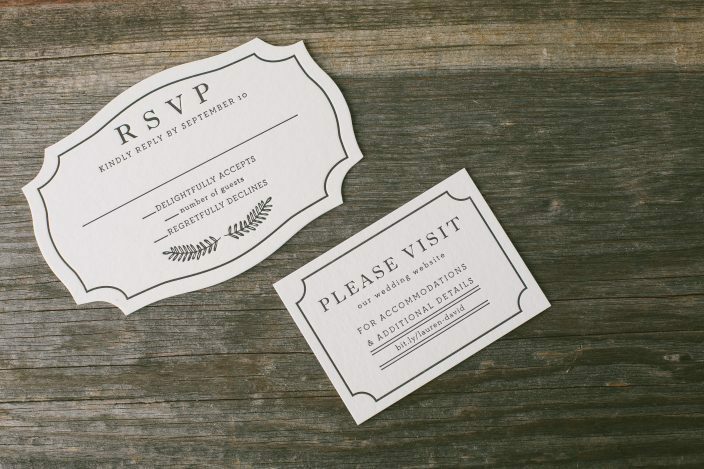 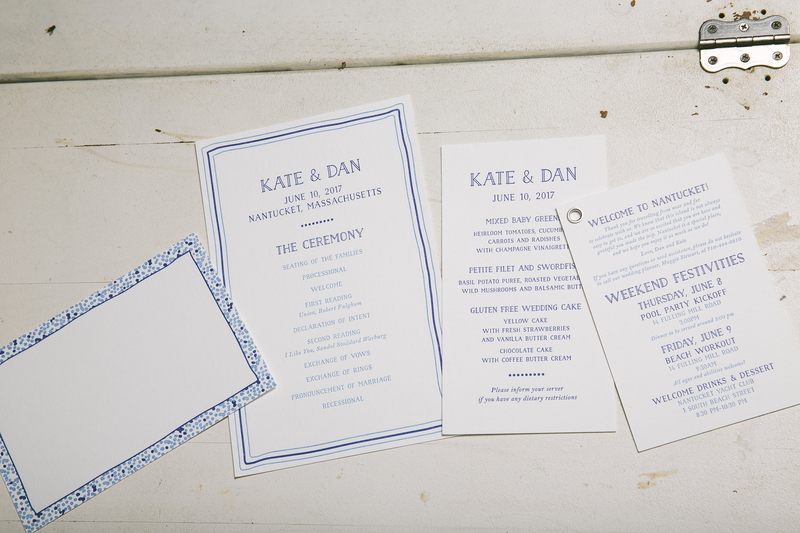 letterpress wedding invitations - Smock. 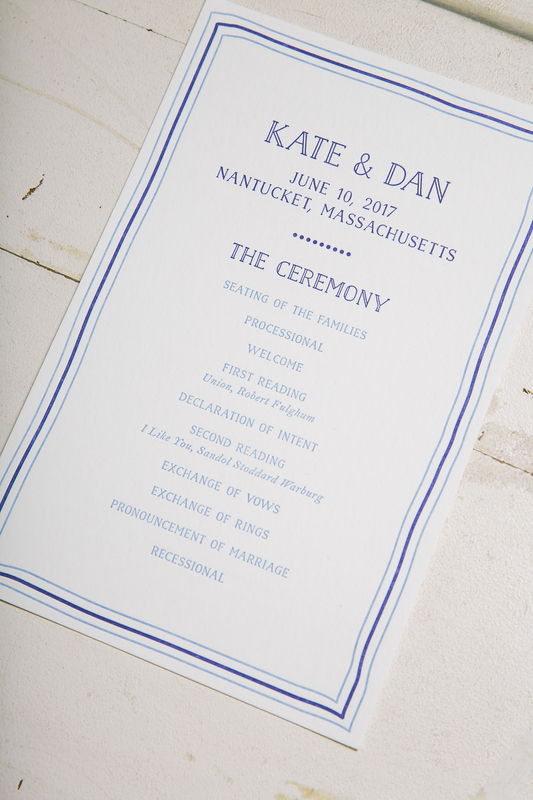 Kate and Dan’s family and friends traveled from near and far to attend their Nantucket wedding celebration this past June. 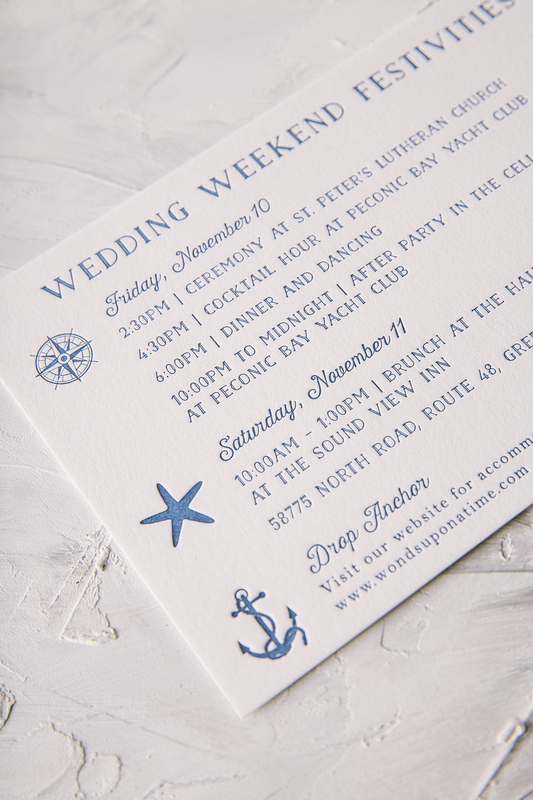 Their nautical letterpress wedding day pieces included programs, menus, table number cards and a details booklet. 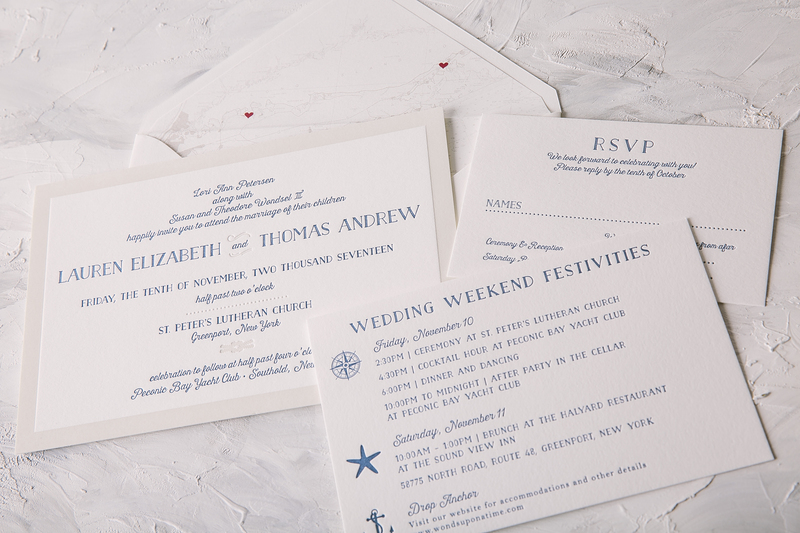 Each coordinated with the other, using blues such as our Royale and Azure letterpress inks as their color palette of choice. 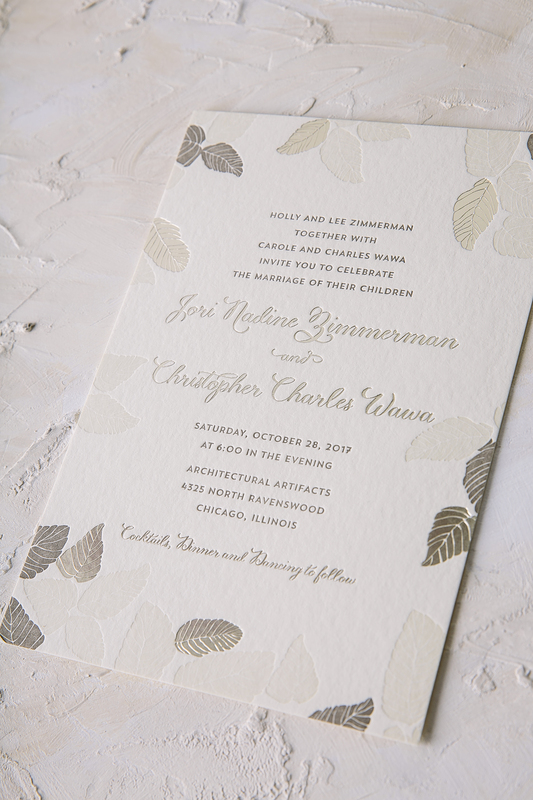 These pieces reflected the easy, laid-back nature of the island with design accents like an organic border around the program and a fun dot pattern for the table number cards. 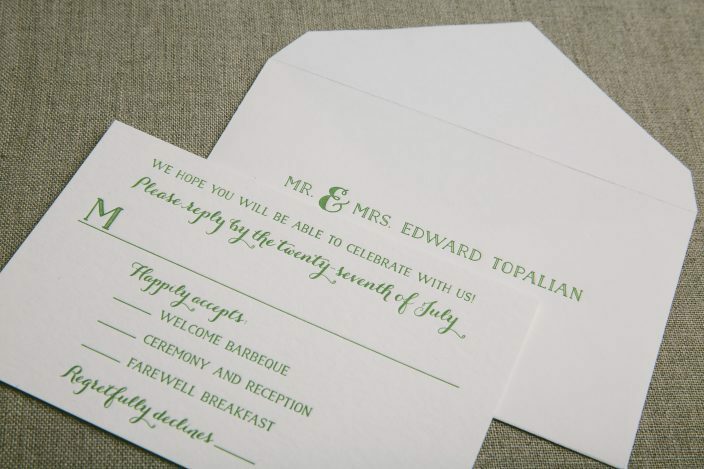 The details booklet added a personal touch with a note from the bride and groom and a list of events scheduled for the weekend. 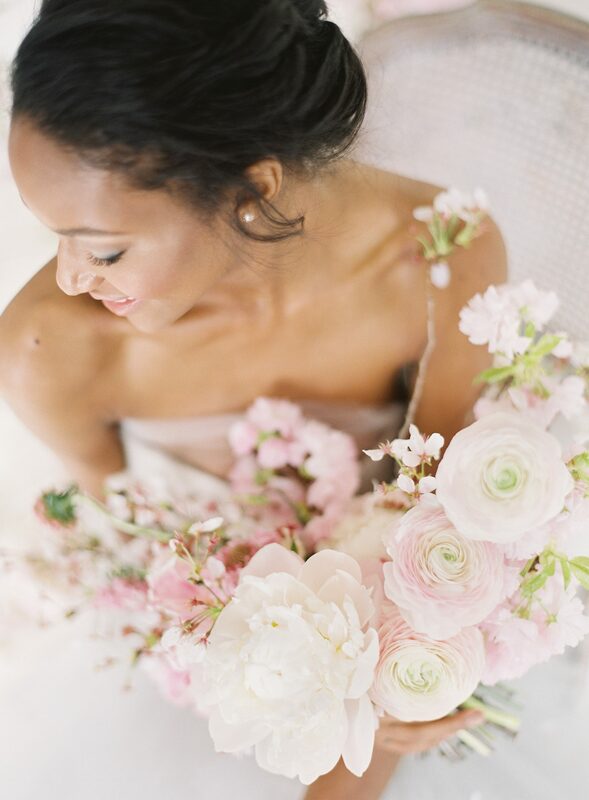 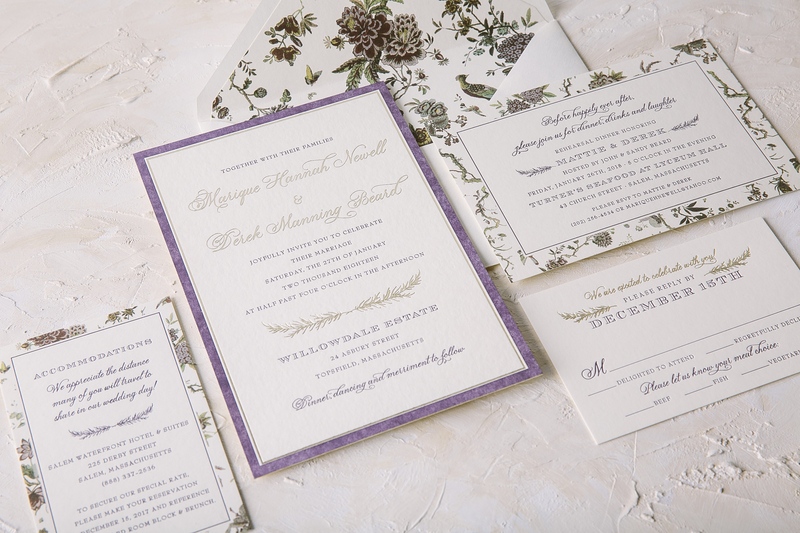 We have no doubt this wedding came together as beautifully as their day of pieces – thanks to the help of Parchment Fine Papers! 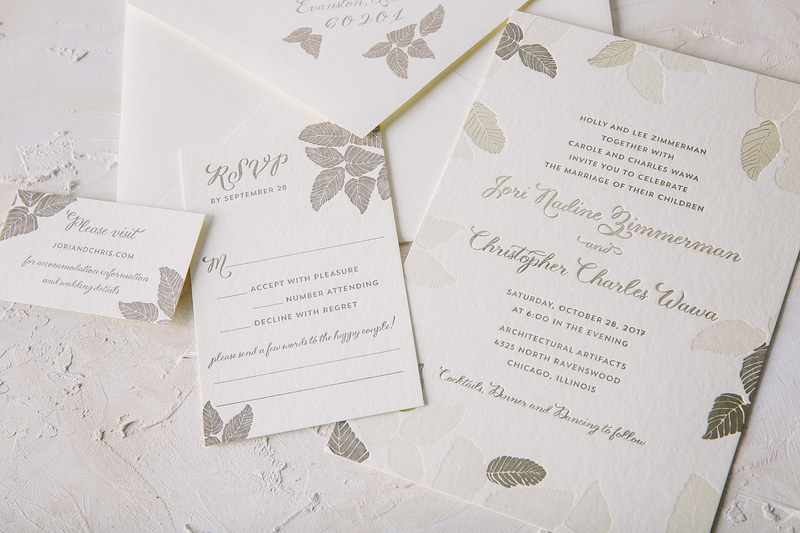 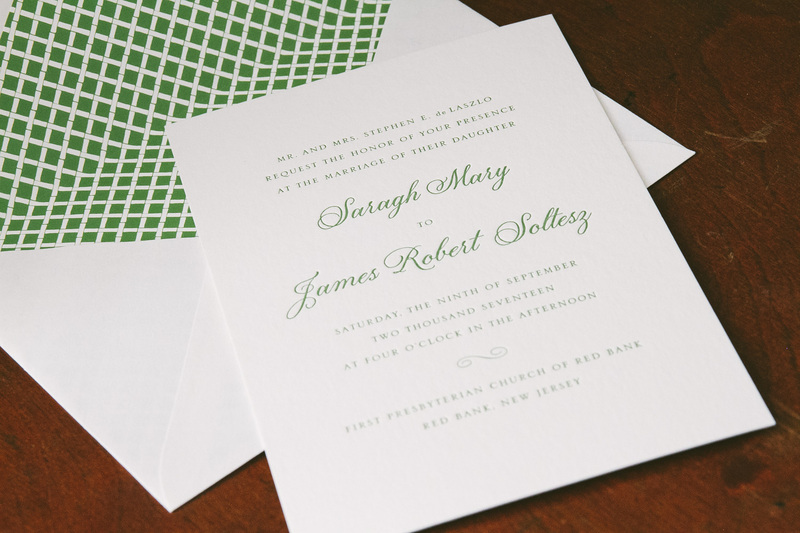 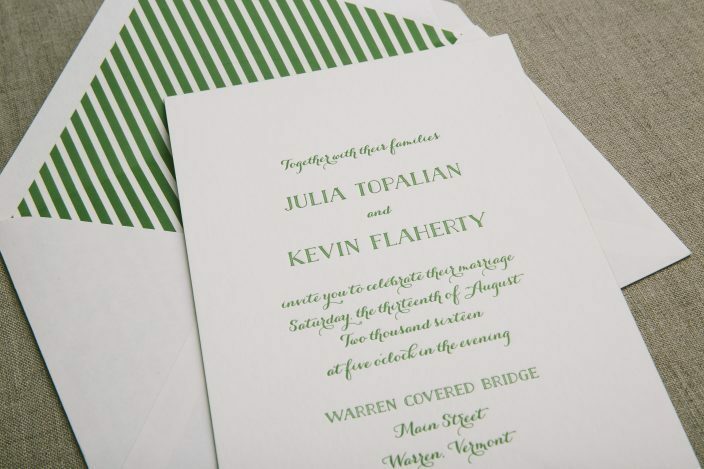 James and Saragh’s wedding invitation suite reflects a monochromatic color palette with green as the leading color. 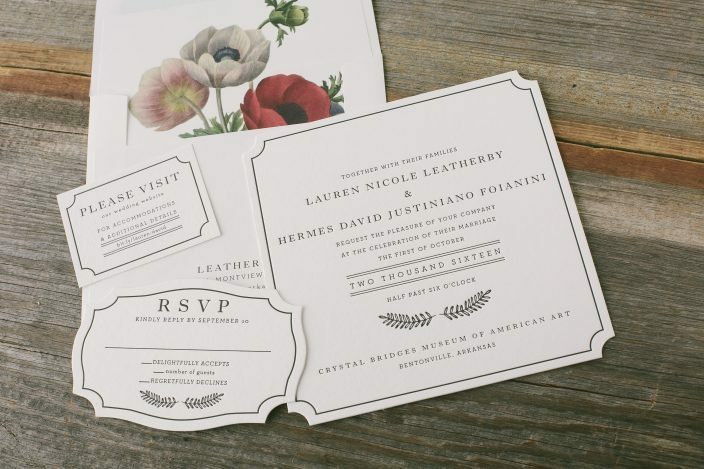 These sophisticated letterpress wedding invitations carry a polished, classic kind of look that will never go out of style. 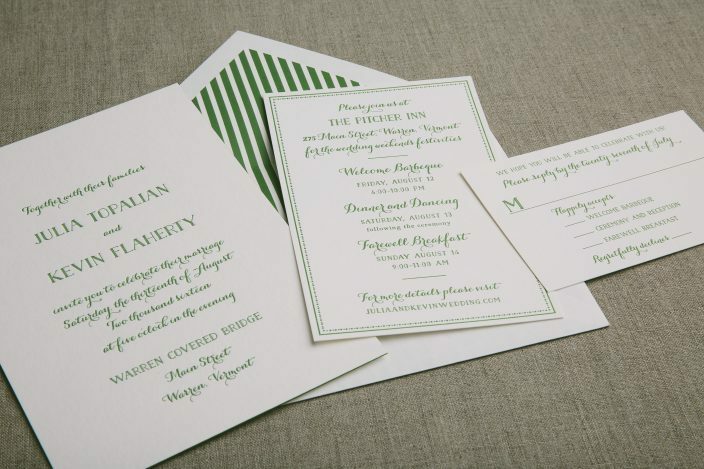 While they decided to keep the cards themselves on the simple side, they played up the envelope liner by using our Payette pattern in Grass to match with the rest of the suite. 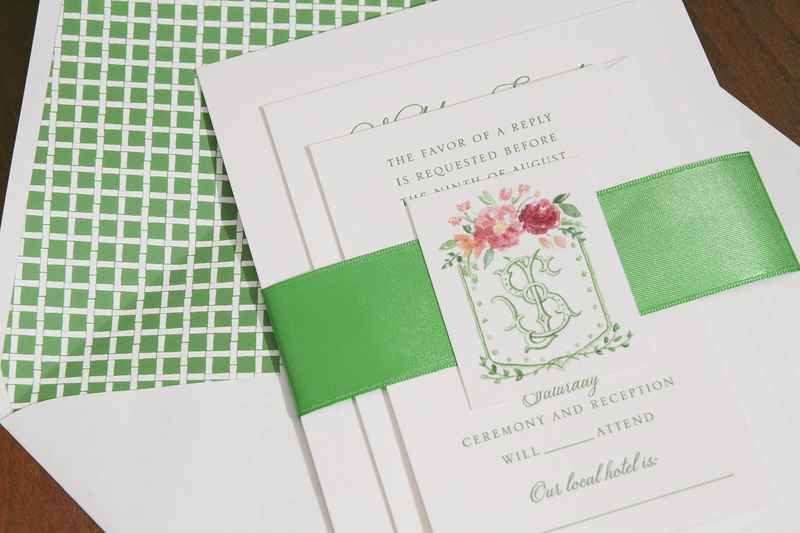 To give this set a little extra love, a coordinating ribbon held everything together with a hand crafted monogram added as the finishing touch. 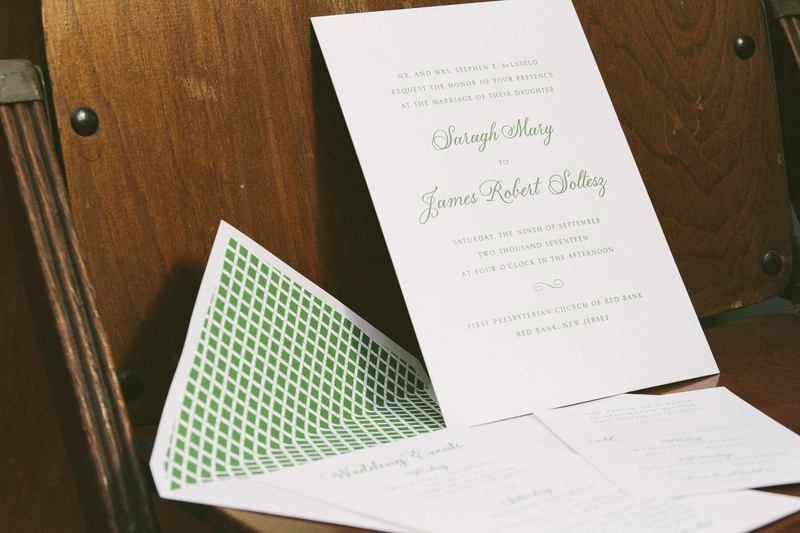 Thanks to the help of our friend Shayne at Ink Papery, James and Saragh timeless invitation suite is something they will still look fondly at even after years of being together. 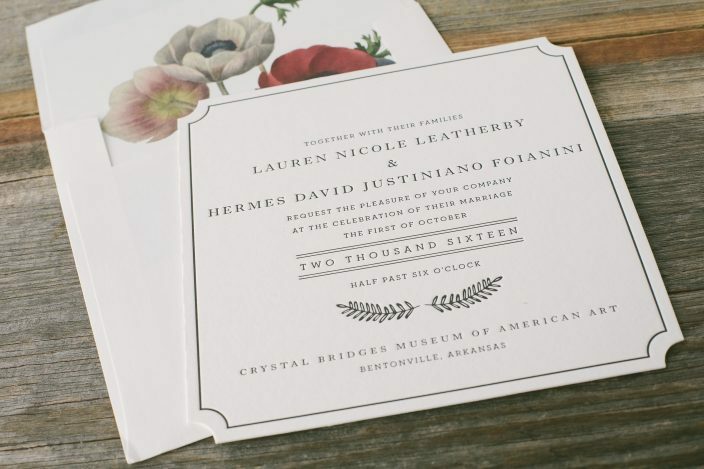 Lauren and Hermes personalized our Halifax invitation suite to set the tone for their October wedding at the Crystal Bridges Museum of American Art. 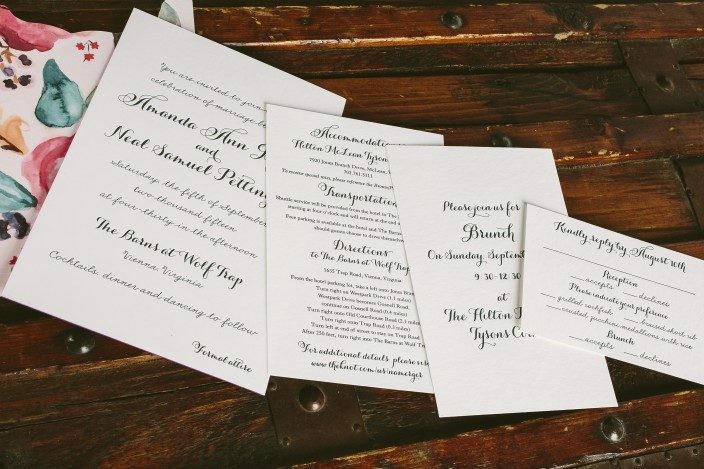 The couple chose classic black letterpress ink on our white bamboo paper for their invitation suite, which mixed our square Belmont die-cut shape on the invitations with our Plymouth die-cut shape on the reply cards. 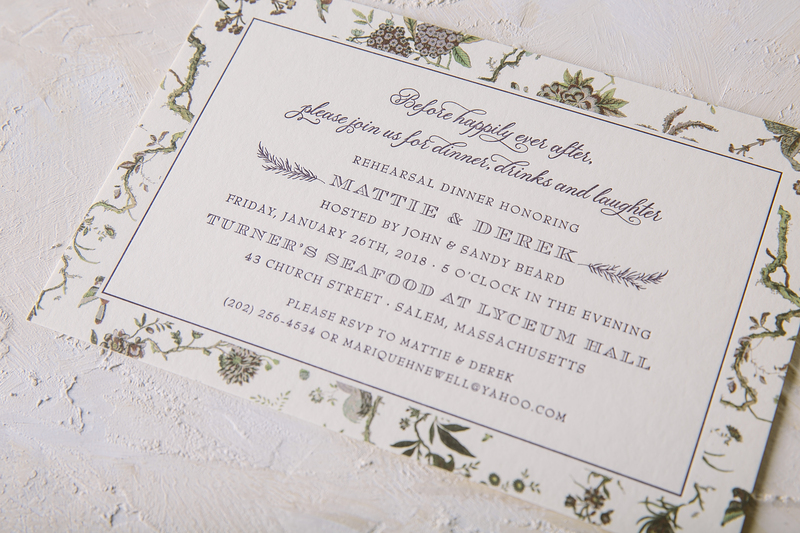 We printed a petite website card to provide guests with information regarding accommodations and wedding day details, as well as a vintage anemone patterned envelope liner to add a splash of color. 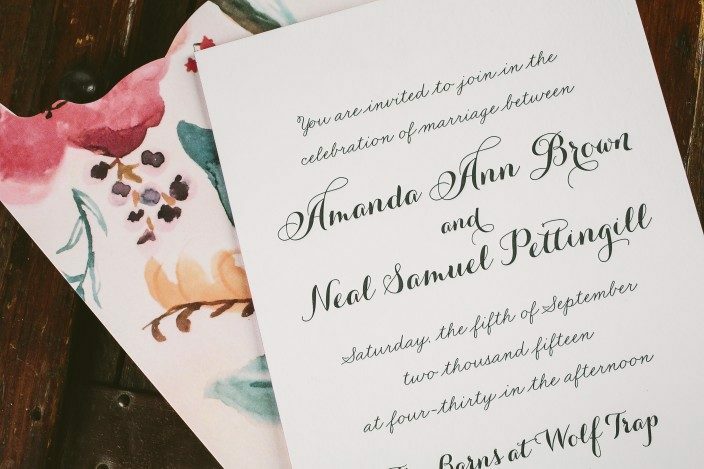 Amanda and Neal created a stylish letterpress invitation suite for their September celebration at the Barns at Wolf Trap. 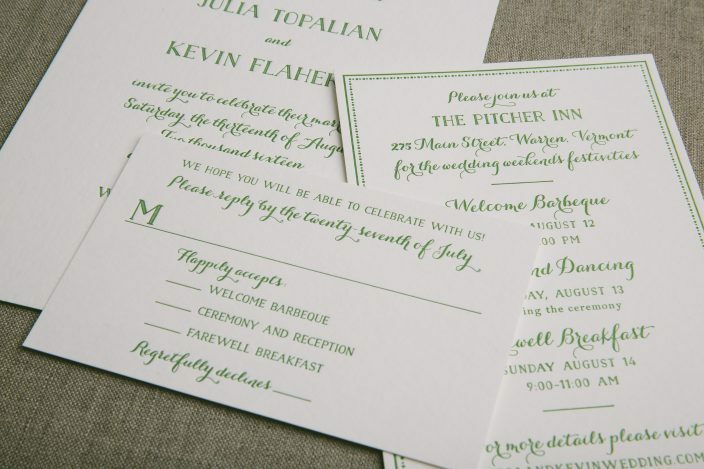 We collaborated with our friends at The Dandelion Patch on the suite, which featured sweet script fonts and letterpress printing in midnight ink on our white bamboo paper. 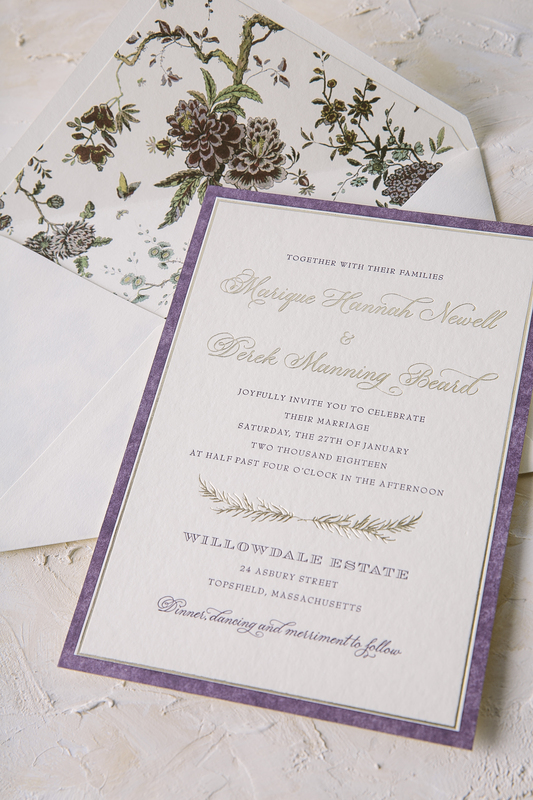 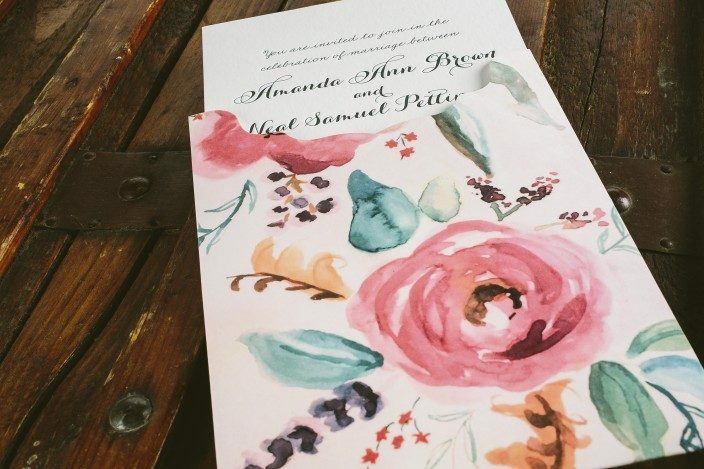 The invitations, information cards, brunch invites and response cards were all tucked inside of the suite’s wow-worthy statement piece: a custom floral watercolor invitation sleeve in varying shades of pink, purple, orange and emerald. 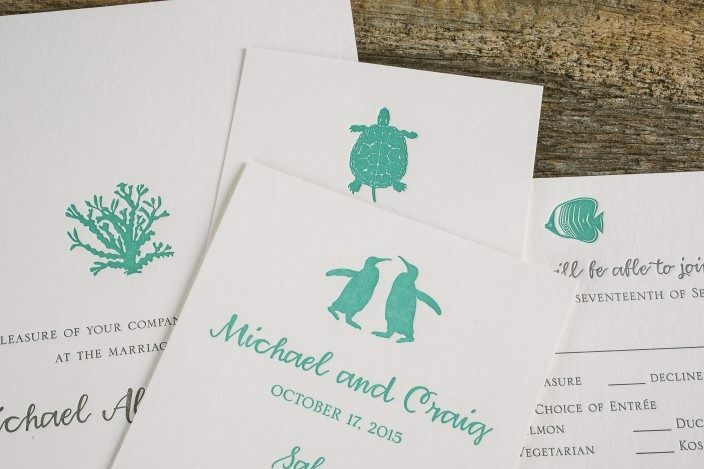 We created a full suite for Michael and Craig’s October wedding at the New England Aquarium using different motifs from our custom library. 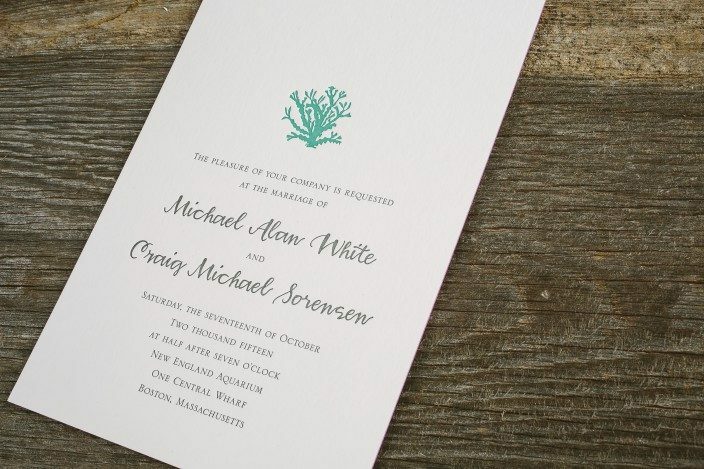 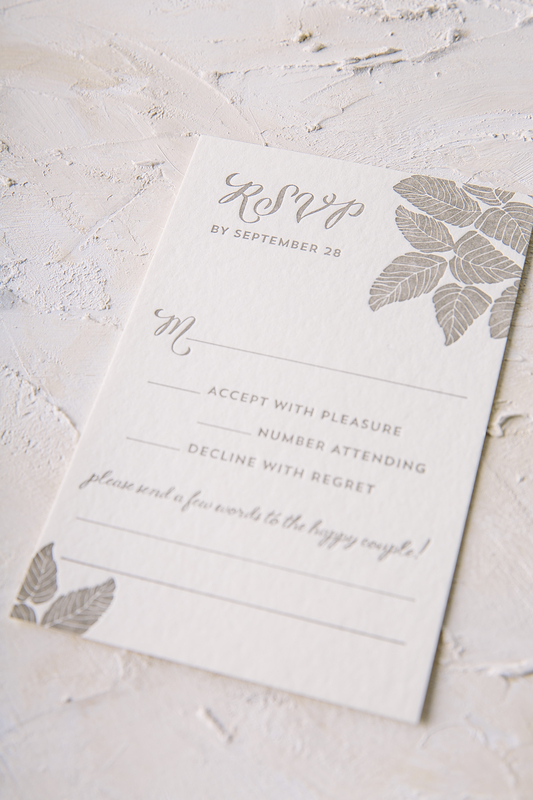 Their custom invitations paired our pewter and ocean inks together on white bamboo paper, with our coral motif and Harrison calligraphy font adding special touches. 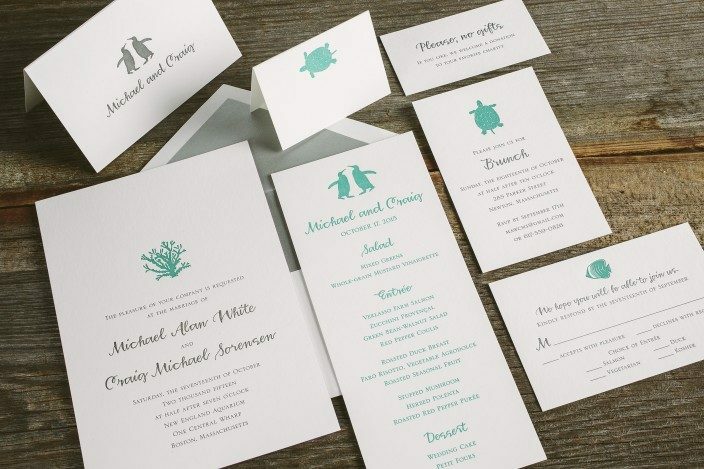 The other cards in the suite included our sea turtle, fish, and penguin motifs, which gave subtle nods to the venue.